Fig. 1. Seira bipunctata springtail collected at this home in May 2013. Important Note: The springtails collected at this residence in May 2014 were examined under magnification, measured, and photographed. The author was not sufficiently experienced to properly identify them to genus or species, especially as they appeared unlike any of the springtails described in the literature. 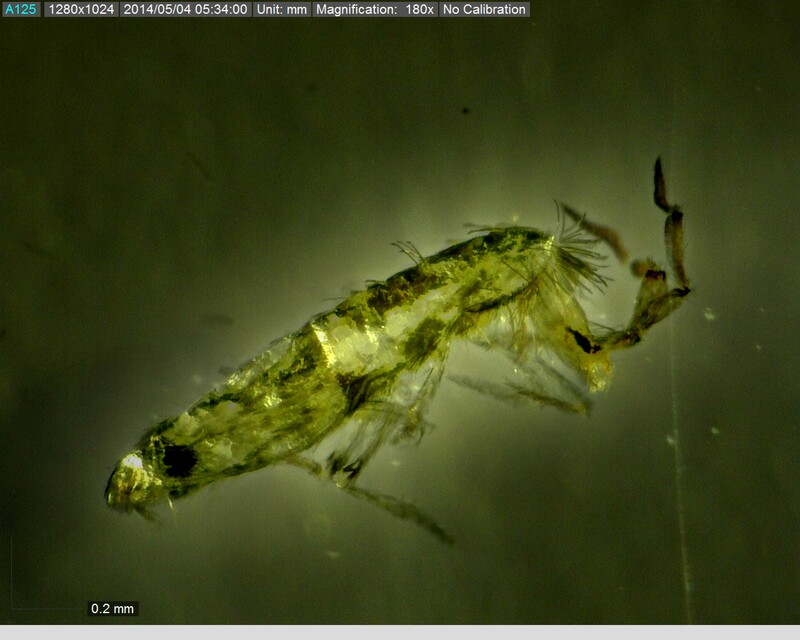 In January 2015 he contacted Frans Janssens, an authority on the Collembola, for assistance. Janssens, with the Department of Biology at the University of Antwerp, Belgium, immediately identified the specimen as Seira bipunctata. He also explained my difficulty in keying to genus and species: the specimens were severely dehydrated, deforming their anatomical characters to the point that they did not resemble their depictions in the scientific literature. 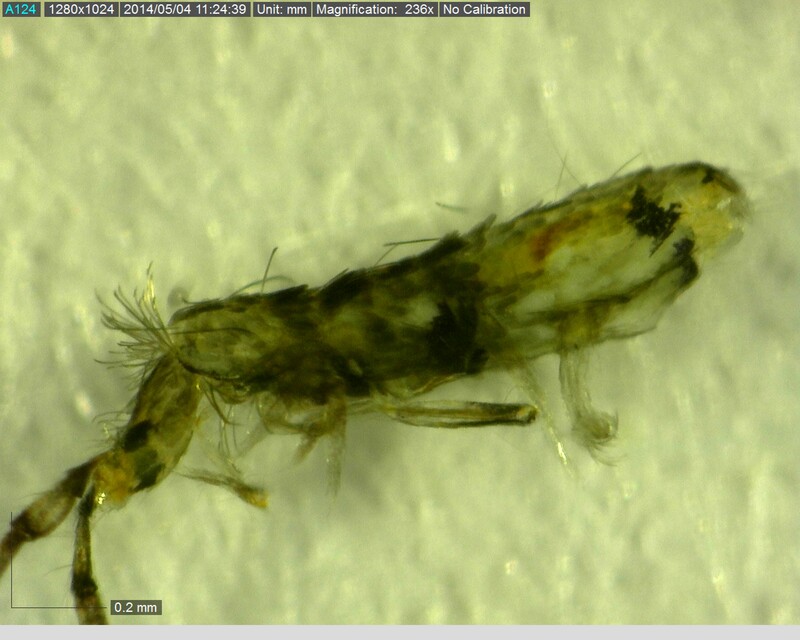 In November 2013 I received a call from residents of a single family home in Austin, Texas, who had been annoyed all summer long by a large number of springtails inside their home. Earlier the homeowners had a similar experience at another home in the general area. In November, when I was called in, ambient temperatures were too low for springtails to be active. I told the homeowners to be patient until next spring, then returned in May 2014 and collected a number of live springtails in the kitchen, dining room, and living room. An examination of the home for evidence of excessive moisture found nothing out of the ordinary except at the upstairs HVAC closet. Though omnivorous, springtails have an unusual affinity for fungi and decaying vegetable matter. Thus, they are often associated with elevated levels of moisture. The homeowners, who had read about the springtail-fungi connection, believed they were coming from either the wood flooring or the home’s siding. The original exterior of this home had, several years ago, been sheathed in vinyl siding. They’d read that, under certain conditions, the space between the old exterior and the new vinyl siding can become abnormally moist, creating conditions that support mold and mildew. Though I inspected the entire home, paying special attention to the wood floors and exterior siding, no evidence of excessive moisture was found anywhere except, as previously mentioned, in the upstairs HVAC closet. The A/C plenum had a noticeable stain on its exterior insulation that appeared to be mildew or mold. An HVAC technician was to be called in to inspect and clean the A/C evaporator coils and plenum. I asked the homeowners to contact me if that did not resolve the springtail infestation. Hearing nothing from them, I assumed all was well, and waited until January 2015 before calling for an update. The news was not good, as the springtail invasion had actually worsened after my visit. I asked if the A/C coils and plenum had been cleansed, as suggested, but was informed that it had not been done. The HVAC technician who was called to the site told them cleaning the coils would be inordinately expensive and would not, in his opinion, do any good. I explained that was probably why the springtails were still present, and asked the homeowners if they would consider making arrangements with another HVAC technician to have the coils cleansed. They agreed to do that, if I would drop by to inspect the coils and plenum, and see to it the cleansing was done right. When I arrived at the home the morning the coils were to be cleaned, the technician already had the coils out of the plenum and had applied a commercial solvent preparatory to rinsing with a stream of water. The interior surfaces of the plenum were coated with a major fungal bloom, and although much of the fungi coating the coils had already been removed, enough remained to show a significant fungal growth had developed there, too. The evaporator coils were then thoroughly cleansed, reassembled in the HVAC, and the plenum was then sealed. We now await warmer weather to see if the springtails return. Springtails, as a rule, resemble tiny fleas. They look like minute black stick-shaped specks that move ever so slowly, making it clear that they are not inert detritus but living animals. If you poke a finger nearby the speck suddenly disappears. It then reappears, just as suddenly, inches or sometimes feet away. Thankfully, unlike fleas, they don’t bite. Though now less numerous than in the other home, they were, in the summer of 2014, still present in this home in significant numbers. As mentioned earlier, during that first visit none could be found. After all, it was late November, ambient temperatures had fallen below 60 degrees F., and few creepy crawlies were creeping or crawling (not to mention jumping, which is what springtails do). In Austin, 2014’s spring sprang late in the month of April. 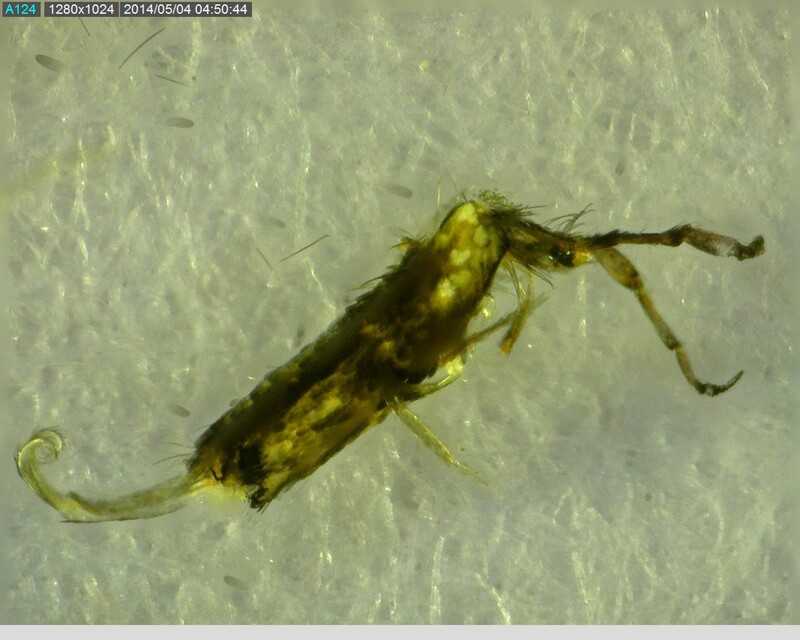 When this same young lady called me on May 1st, to say that the springtails were back, I wasn’t surprised. The next day I dropped by for a look. Though none could be found outside, I was able to collect a significant number of springtails inside her home for microscopic analysis. Most — including the specimen depicted in Figure 1 — were collected in the kitchen, where they could be found jumping about in the cupboards, in the sink, on the window sills, and in the pantry. Fig. 3. A 3rd S. bipunctata sporingtail collected in this residence. This article, which is in process, will discuss the biology of springtails and how they can be controlled. Though annoying, they are not believed to pose serious threats to man or our pets, though some authorities point out that springtails are capable of producing skin irritation and even lesions in susceptible individuals. The extent of their role as pests and causes of human discomfort has not been well documented. Perhaps their most important practical role is that of awakening us to otherwise invisible environmental dangers. Like many of the organisms we are likely to find sharing our environment, their presence is symptomatic of habitat dysfunctions that may pose threats to us and our pets. Fig. 4. A 4th S. bipunctata springtail collected at this residence. Note the number of loose scales and setae in the vicinity of the specimen. 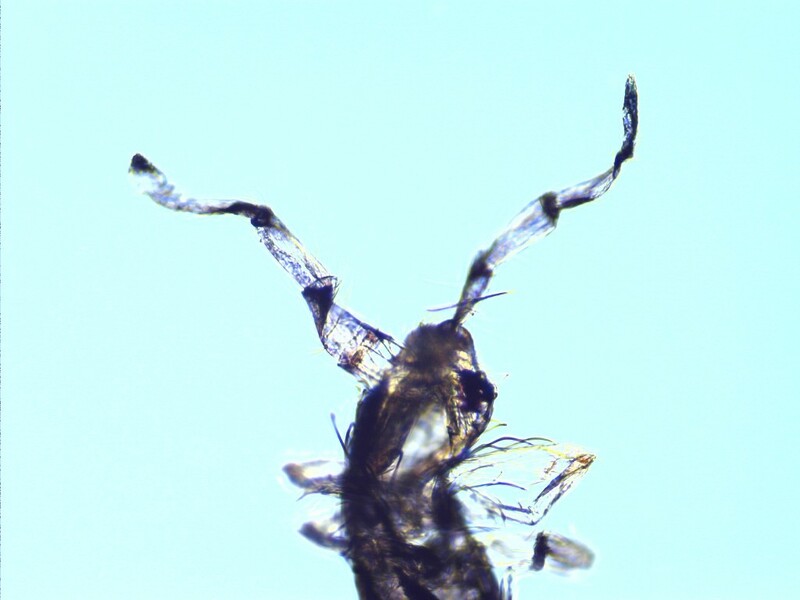 Most springtails feed on fungal hyphae or decaying plant material (Hopkin, 1997). Outside, conditions that produce fungi and decaying plant matter abound in unmanaged compost heaps, unkempt piles of leaves, grass, or other plant matter, layered mulch and similar materials in the yard and along the perimeter of the home, and associated with leaf mold inside gutters and downspouts. Inside a home such conditions usually are found in high-humidity, confined spaces, i.e., any place where rain-water infiltration occurs during rainstorms, any place where water leaks of any kind exist, in poorly drained showers, behind and under clothes washers if water regularly collects there during washing, inside clothes-washer drains, under refrigerators with condensate pans, and in the condensate pans and drains of the home’s evaporator coil enclosures. Such spaces produce corrosion, air pollution, and wood rot, all of which are contrary to healthy living, healthy breathing, and maintenance of a healthy home. Whenever large numbers of springtails are discovered inside a home, the homeowner is well advised to inspect the home thoroughly for signs of fungi, algae, or mold. Once such signs are found, steps should be taken to correct the conditions allowing their growth. Once this is done, sightings of springtails should cease. Fig. 5. 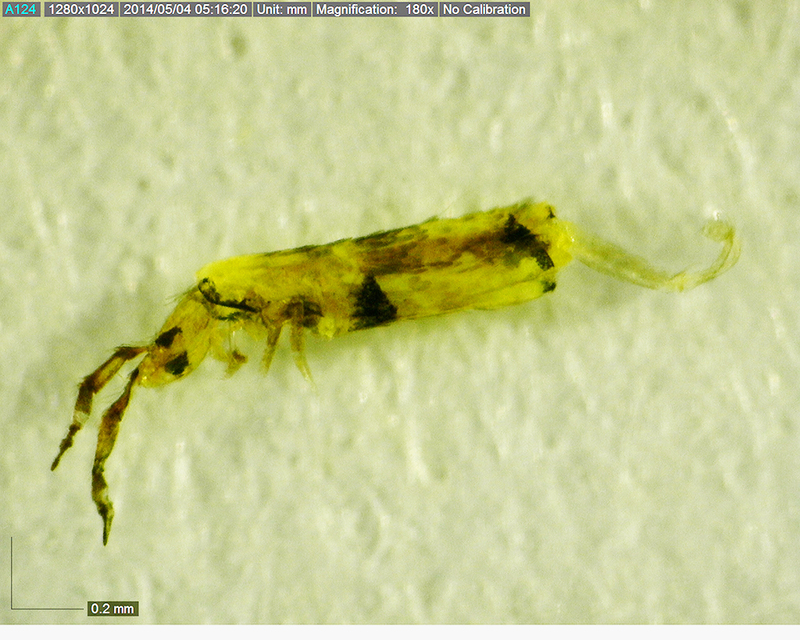 A fifh S. bipunctata springtail collected at this residence, showing the head, antennae, and first two set of legs. No springtails were present inside the home during the cooler months of the year, despite the fact that inside temperatures remained fairly constant year-round. This suggests that the springtails invading this home (which appeared to be members of the Collembola order Entomobryomorpha) were associated with either (1) a condition of fungal/mold growth inside the home that only occurred during the warmer months of the year, or (2) a similar condition in the yard or on the exterior of the home. Most sources of fungi or mold would be present all year long. Clothes washing frequency is not usually tied to the seasons; nor is the use of refrigeration for perishable food items. Rainwater infiltration may actually increase during the cooler months, though that appears not to have been the case during the winter of 2013-2014, but since it usually takes months for soaked wood inside walls to dry out, even long dry periods would not stem the production of some amount of fungi in such places. In light of these considerations we are inclined to rule out most of the common sources of fungi and mold inside this home. An exception is the fungi, mold, and algae commonly associated with the central air-conditioning system. Fig. 6. Interior of HVAC plenum, showing fungal bloom at top of plenum cavity. During the late fall, winter, and early spring, the furnace would operate, keeping the HVAC unit dry as a bone and entirely free of mold and fungi. Once the air-conditioner cranked up, in the early springtime, fresh mold and fungi would be free to form and thrive in the condensate pan, if such were present in the form of spores from the previous year. Springtails would be able to exploit any fungi or mold inside the unit, either by entering the home through the condensate drain tube that leads to the exterior of the home, by emerging from protected reservoirs of eggs and/or dormant adults, or both. Fungi, mold, and algal buildup inside a home’s interior a/c unit is a common problem in residential and commercial structures. The most serious consequence is a clog in the condensate tube that is caused when the fungi fully obstruct the passage of water. Such clogs cause the primary condensate pan to overflow, either into a secondary pan or into the home itself. Fig. 7. 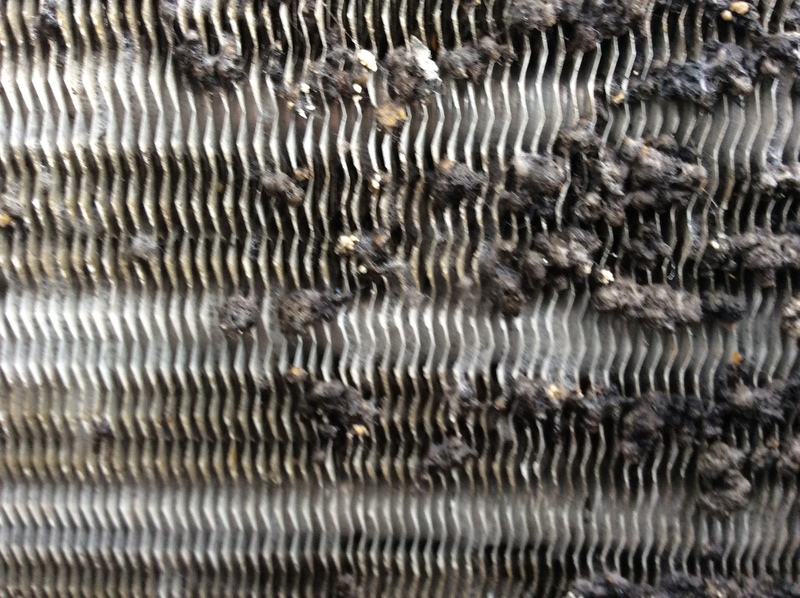 Fungi, bacteria, and debris in evaporator coils of this HVAC. Somewhat less serious, but still problematical, is the buildup of fungi and algae inside the condensate pan itself, and spreading onto the evaporator coils, the walls of the enclosure, and into the ductwork. When that happens, the air circulated through the a/c ventilation system will often take on a musty odor. In the most serious cases, the smell resembles the odor of dirty socks. Such is not the case here, as no mustiness could be noted in the air flowing out of this home’s ventilation system. 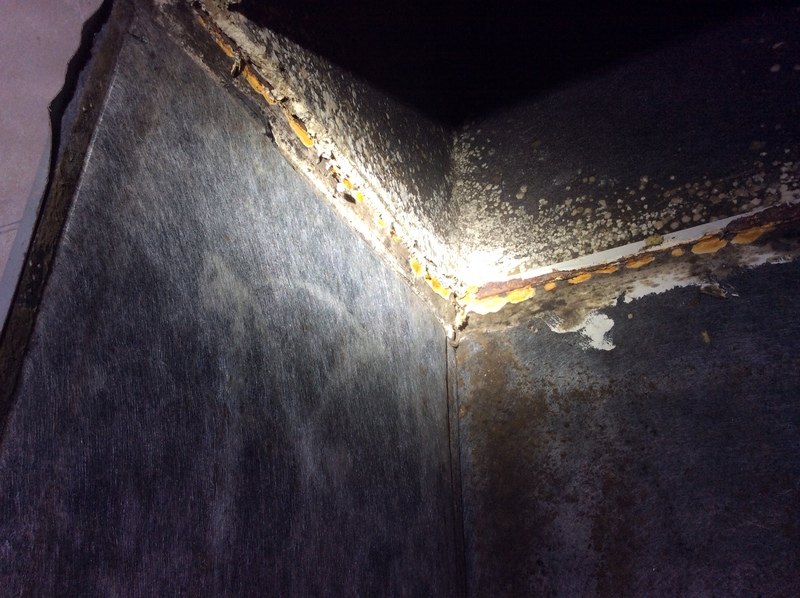 Still, from all indications the a/c evaporator coils in this home had not been cleaned since the unit was installed in 1985, and some evidence of mold was showing in the sealant at the top of the coil enclosure. The mystery continues… Stay tuned as we delve more deeply into the possible sources of springtails inside this residence. Kingdom Animalia — an-uh-MAYL-yuh — “animals”; multicellular, eukaryotic organisms whose body plans become fixed during development, some of which undergo additional processes of metamorphosis later in their lives; most are motile, and thus exhibit spontaneous and independent movements; all animals are heterotrophs that feed by ingesting other organisms or their products. Folsom, J. W. 1937. Nearctic Collembola or Springtails, of the Family Isotomidae. Smithsonian Institution, Bulletin 168. Hopkin, Stephen P. 1997. Biology of the Springtails (Insecta: Collembola). Oxford University Press. Lubbock, John. 1871. Monograph of the Collembola and Thysanura. London, For the RAY Society. Meek, Frank. 2011. Occasional Invaders & Overwintering Pests. Mallis Handbook of Pest Control, Tenth Ed. Questions? Comments?Corrections? e-mail jerry.cates@bugsinthenews.info regarding your experiences with, or concerns about, springtails or similar organisms. You may also register, log in, and leave a detailed comment in the space provided below.